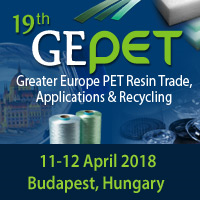 CMT’s 19th GEPET Panel in Budapest on 11-12 April assesses solutions to Europe’s PET resin supply crunch as well as Europe’s targets of PET recycling, usage of rPET in PET packaging, and sustainable PET packaging applications. Hungary, a gateway to the emerging Central Eastern European markets and a vibrant economy with high growth for past decade, is an ideal location for CMT’s 19th GEPET. Hungary, a gateway to the emerging Central Eastern European markets and a vibrant economy with high growth for past decade, is an ideal location for CMT’s 19th GEPET. Aptly, Hungary’s leading manufacturing and bottling company Aquarius-Aqua presents paper on ‘Bottled Water & Energy Drink Market in Hungary’ outlining the packaging trends, its green mission and developments for the future. RECY-PET Hungary that recycles much of Aquarius-Aqua’s plastic scrap is sharing on ‘PET Recycling Market in Hungary, Collection Rates & Infrastructure plus an Update on the RecyPET Recycling Project’. In addition, a site visit to RecyPET Karcag has been arranged exclusively for summit participants. The Global PET market, pricing trends and raw materials outlook is presented by KI Group while ‘Innovative & Sustainable Solutions for PET Sheet & Thermoformed Products’ is shared by Coexpan. As Europe is committed to sustainability, a panel discussion on ‘Advancing the Recycling of Plastics in Europe & Transitioning Towards a More Circularity Platform for PET’ is led by Plastics Recyclers Europe while Nextek presents the ‘Catch Plastics Initiative and How the PET Industry can Work Together to Reduce Ocean Plastics Waste’. The program also includes – ‘Sustainability in the Textiles Industry – Innovations from Polyester & Biofibers for Automotive & Textiles Applications’ by DS Fibres, then session on ‘Commitment from the Textiles and Global Brands to Increase Use of Recycled Polyester (rPET) by at Least 25 Percent by 2020’ from Fabrikology International. Organized by Centre for Management Technology (CMT), the summit’s sponsors are Frigel and viscotec. Visit 19th GEPET website or call Ms. Grace Oh at +65 6346 9147 for details.